The N.C. Chronicles. 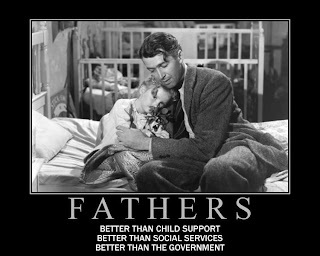 : Any attacks on men is an attack on all fathers. In my opinion if we can be realistic and expose these offensive inaccurate pictures for just one minute.. I see some women's study student holding a sign that says "No victim is to blame". Well to this little girl and those like her who don't tell the real story, where the hell did you ever hear anyone blaming a victim of a crime...OK, there might be a few "people" who blame victims, but 99.9% of "people" do not, why not express that truth??? Fortunately, not all women think this way, more and more are turning their back on such disgusting attitude towards their fathers. Every time someone spits out venom at a man, that man is a little girls daddy,and recognize that Daddy is not always going to be here...So never let people with an inferiority complex(feminists) dictate how you should see Daddy, because as you know, you will always be daddy's little girl. 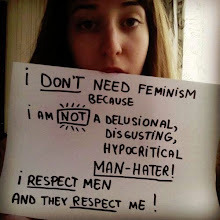 I am so sick of feminist's hiding behind and using the word "equality". That's the last thing on their mind. More privelage and unaccountabilty with the funding to go with it,is what they want. True "equality" is a feminist's worst nightmare.